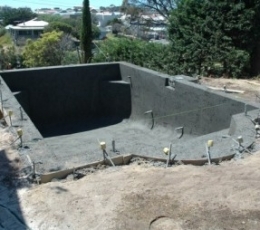 Steelwater Pools and Spas steel fixing service will give your dream pool extra strength and stability, to ensure your family will get maximum use out of your in ground pool for years to come. 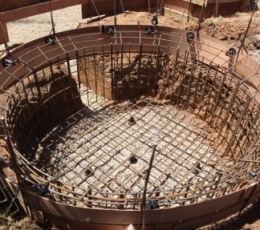 We will fasten dozens of 12mm 400-grade steel reinforcing bars together and mould them to the desired shape of your concrete swimming pool before the concrete is poured. 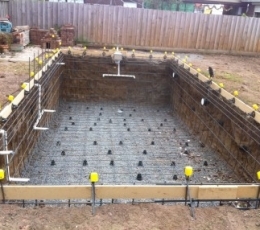 We use tie-wire at the junction of the bars to hold them together and ensure they stay put in the correct place and really strengthen your pool’s shell. 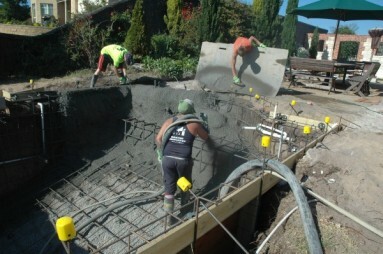 After the steel reinforcing bars have been molded to the correct shape, an independent inspection takes place to ensure your swimming pool design has been constructed to the Australian standards and engineer’s specifications. 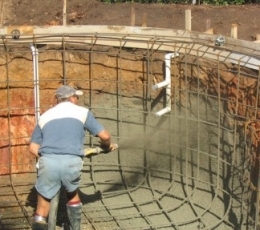 Steelwater Pools and Spas is built on the practice of steel fixing. 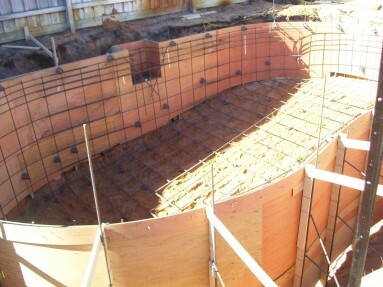 We know this to be the best method of swimming pool building. It provides flexibility in terms of shape and design. And it will outlast a fiberglass pool by decades. 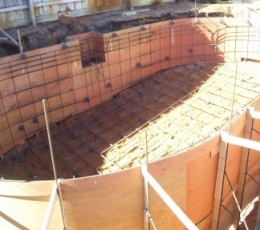 We also use formwork as a method of molding the shape of the concrete structure to install in ground pools. 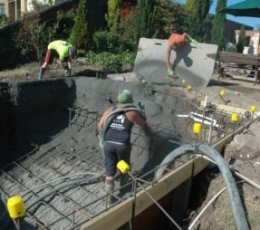 Formwork is one of the most important processes in building pools in Melbourne – a good formwork is required to produce a strong and stable concrete shell for your pool. 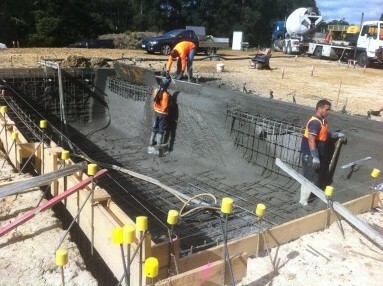 For further information, contact 0404063383 for the leading steel fixing, swimming pool builders in Berwick Melbourne. 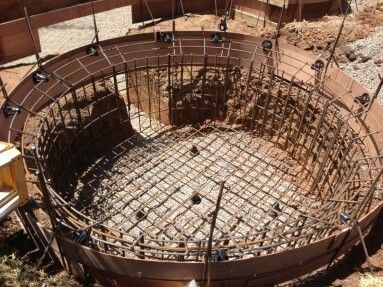 In late 2010 we had Steelwater pools build an in-ground concrete pool and spa. During this time we found Steelwater Pools to be very professional, considerate and easy to work with. I have recommended them to others and will continue to do so. A year later I still ring Dwayne for advice and he is always happy to help with any queries. Thanks again. It has been a pleasure dealing with someone who really cares about his work. We love our pool and the enjoyment it has bought us. I found Steelwater Pools and Spas in one of the pool magazines and gave them a call, they were extremely helpful and gave us some great ideas, nothing was ever to much trouble and we couldn't be happier with the finished product. 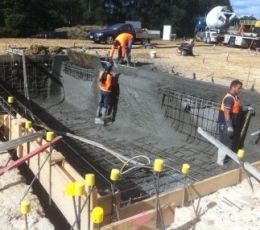 Steelwater Pools and Spas designed and built my swimming pool in 2011 and I would highly recommend them to anyone looking for a high quality swimming pool builder in Melbourne. What can I say, I can’t thank Dwayne and his team enough. Dwayne eased my mind, and gave me confidence that everything will be fine. Dwayne runs his operation like clockwork, a consummate professional, always functional, contactable day or night. His work is flawless ensuring construction is built of the highest standard. I was absolutely amazed with his focus, passion, workmanship, and attention to detail . 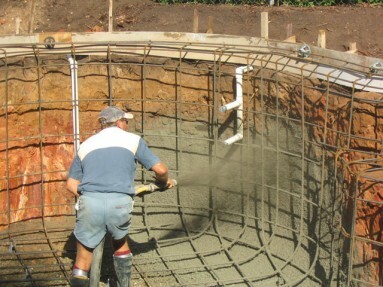 He made the whole process seem so simple and effortless, knowing how complex building a pool really is. Dwayne and the Steelwater team provide a quality and professional product. 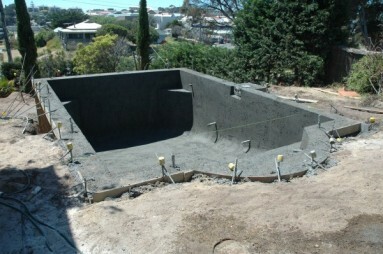 Dwayne was very helpful and knowledgeable with any questions and advice I needed on my swimming pool project. I would highly recommend Steelwater to anyone. 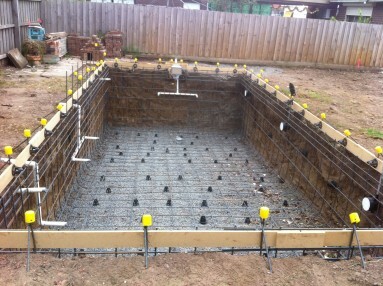 We approached Steelwater Pools to build our swimming pool after we found out about Magnapool. It was an ideal solution for our children who suffer from skin conditions and elegies. Our kids don’t have any problems swimming in their pool, no itches or rashes which they would normally get from a local swim center. Steelwater were great. Each step of our construction seemed to be smooth and nothing was ever a problem for Dwayne and his team. They were always on time and left our yard clean as it was before they started. Fantastic service, Great Advise, Highly Professional, I can highly recommend Steelwater Pools. Steelwater Pools and Spas were recommended to us by friends who had a Swimming Pool built by them. With so many pool companies out there we didn’t know who to trust. They provided good honest service with a fantastic result. Nothing was ever an issue and Dwayne's advice was invaluable.